Rhinoplasty often uses cartilage grafts for various augmentative and supportive nasal needs. Most of these cartilage grafts are more modest in size and are harvested from the septum or ear. 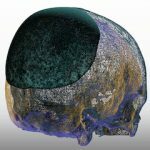 Such grafts are placed by conventional suture fixation or even as onlays in a crushed shape. Numerous techniques to prevent rib graft warping has been advocated and none are perfect. One technique is to straighten the rib graft and then maintain this shape through the insertion of an internal support. The use of small metal K-wires can be used as this internal support and they are easily driven into a rib graft by a power-driven handpick. With this rhinoplasty grafting technique background I saw a patient who came in with a sharp object sticking out of the roof of her mouth. She reported a history of having had a rib graft rhinoplasty several years ago. One examination it was an obvious K-wire with the sharp pointed end. When matching its orientation with the nose above it, it was in alignment with her columella. 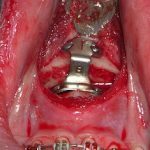 Putting the unusual location of a surgical K-wire in her palate with her rhinoplasty history, it was obvious she had a rib graft placed into the columella that had been straightened and fixated with the K-wire. Over time for reasons unknown the small metal rod worked its way through the palate and became exposed in the mouth. 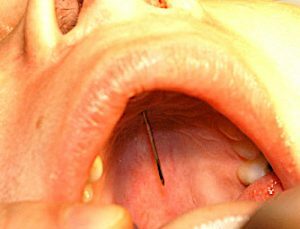 The K-wire was easily removed under local anesthesia. K-wire fixation of rib grafts is an effective technique to prevent postoperative warping. But like any foreign object placed into the body it has the potential, even as unlikely as it may seem, to migrate and end up in places for which it was never intended.